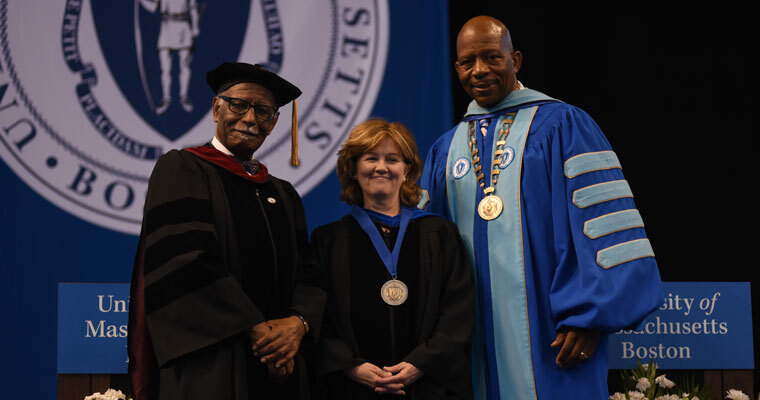 Three outstanding faculty members were presented with Chancellor’s Awards for Distinguished Scholarship, Teaching, and Service during the undergraduate Commencement ceremony at the TD Garden on Friday. Professor of Management and Marketing David L. Levy was this year’s recipient of the Chancellor’s Award for Distinguished Scholarship. Levy has contributed valuable research to his field, with a particular focus on how businesses function in the face of complex issues like climate change and globalization. In his 25 years at UMass Boston, Levy has raised nearly $4.5 million in external grants. Levy is the founding director of the College of Management's Center for Sustainable Enterprise and Regional Competitiveness, and has helped to build the Organizations and Social Change research group. He is the author of two books and 29 scholarly articles. 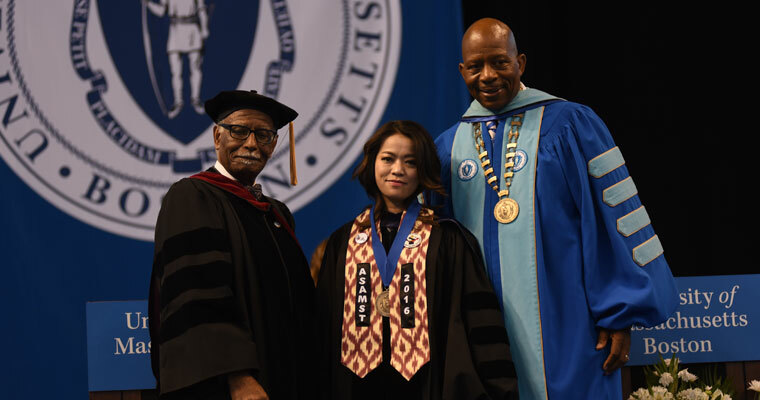 Associate Professor Shirley Suet-ling Tang received the Chancellor’s Award for Distinguished Teaching. Tang teaches in both the Asian American Studies Program and in the School for Global Inclusion and Social Development. Her innovative Asian American Media Literacy course allows undergraduate students to create their own media projects. Many of the films from this class have gone on to be finalists in the Short Films category of the annual Boston Asian-American Film Festival. Admired by both her peers and her students, Tang has developed 16 different courses over the past decade. “I would not be the person I am today without the mentorship of Professor Tang,” said one former student. Professor of Gerontology Jan E. Mutchler received the Chancellor’s Award for Distinguished Service. Mutchler’s scholarship focuses on the challenges facing aging populations in Massachusetts and around the world. Her scholarship extends beyond the walls of the university and into the community, where she continues to play a role in helping town governments and community leaders ensure the welfare of seniors. Mutchler is the founder of theMcCormack Graduate School's Center for Social Demographic Research on Aging, which helps local towns and cities prepare for the needs of their aging residents. She also collaborated with the City of Boston to investigate the lives of senior citizens in Boston through the World Health Organization’s Age Friendly Cities initiative.